Washing the dishes or "dishing up" was done in the following manner. The galley dishes were washed in the galley by the cooks after every meal. In the galley, a "slop" bucket was always handy for the cooks to dump in any leftover food that could not be saved. This slop bucket was dumped in the galley sink, since it was fitted with a "garburator" that macerated all the leftovers. Then, the cooks would wash all their pots and pans. The same thing would be done by the night chef before breakfast, so there was never any accumulation of dirty dishes in the galley. As far as all the plates and utensils used by the crew to consume their meals, they were washed in the areas of the boat where they were used. The watch keeper did the dishes for those living in the after torpedo room; there is a very small sink used for that purpose. They were washed and dried there, the utensils put back in a drawer and all the plates brought back to the galley. 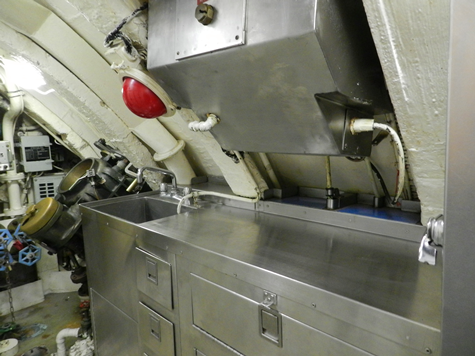 As for the crew members eating in the forward mess, the dishes were washed in the sink next to the garbage ejector (seen on the left). I do remember an incident on the Onondaga, where a lot of the crew became ill with severe diarrhea. 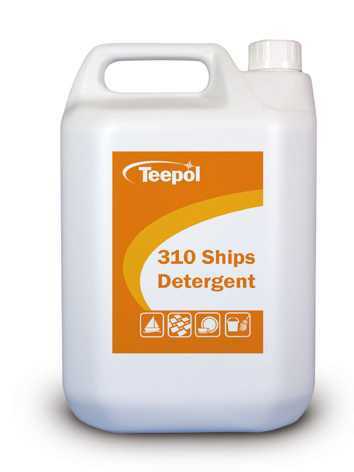 It turned out that we had run out of dish washing liquid, and someone decided to use a product called "teepol" an industrial soap used to wash decks and so on. The plates used were made out of a very hard plastic material "melmac", and the teepol could not be rinsed out properly from all the tiny grooves made by cutting your food. So, it was not bad food that caused the illness as it was thought at first. Once they stopped using teepol, everyone was back to normal. Ah! the life of a submariner.